High resolution, precision and accuracy: The FAZT I4-16W Interrogator returns measurements in 1pm steps across its wavelength range. Using patented FAZ Technology scan-by-scan calibration to its internal Gas Cell, the instrument features 0.5pm absolute precision and absolute accuracy of 3pm. 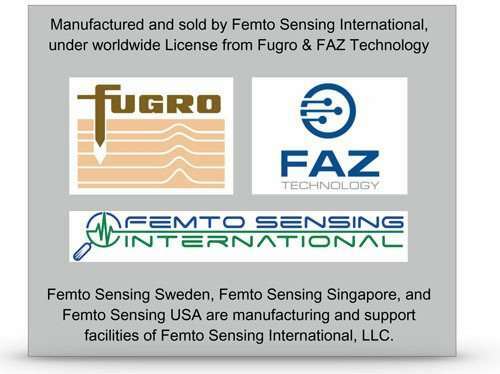 Top reliability: The FAZT I4-16W Interrogator is based on a semiconductor tunable laser that has no movable parts, no tunable filters, and no opto-mechanical switches, which delivers top reliability over a broad temperature range to form an integral part of a very rugged and reliable sensing system. 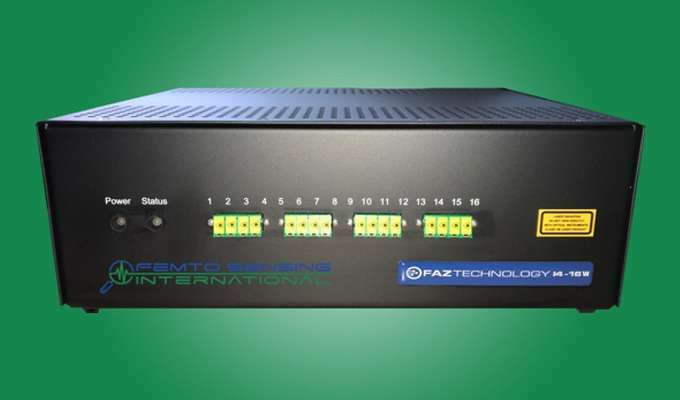 Systems and network ready: High speed data acquisition and on-board computer processing make the FAZT I4-16W easy to use and easy to transmit large volumes of data by network connection. 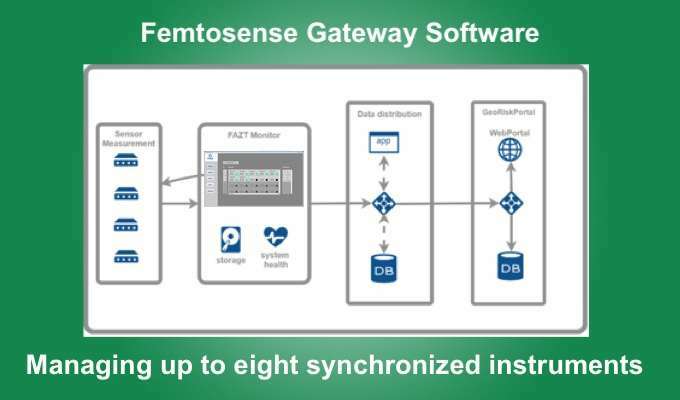 Trigger Input support enabling synchronization of multiple optical and electrical sensor systems. 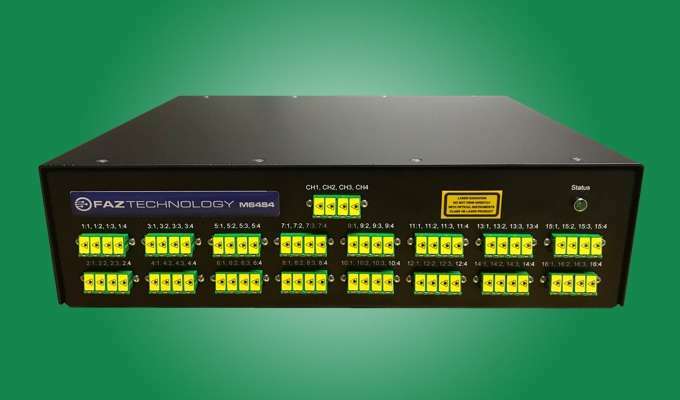 The Ethernet port for high speed data transfer is 100Mbit/s, with all interrogator settings programmable over a REST interface. NTP (<10ms timestamps) Time accuracy with optional GPS time (<10µs timestamps). 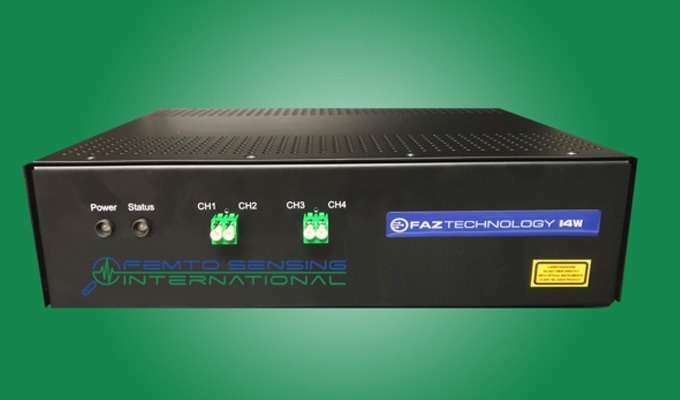 Low Cost and High Quality: The FAZT I4-16W Interrogator is based on the company’s flagship ultimate performance FAZT I4G Interrogator and it has been optimized to address applications demanding a lower cost higher channel unit while maintaining the quality and reliability of a premium grade instrument. Note 1: FBGs from 100pm to 1.5nm BW@3dB (FWHM) are supported. Note 2: Dynamic programmable receiver gain per sensor (4 levels covering 12dB of gain) delivering >25dB optical power dynamic range (saturation – minimum detectable power levels) at 200Hz sweep rate.